On the way back from the skyzone trip with the youth, Leigh and I somehow got on the subject of the 1996 Olympic Games in Atlanta. It’s possible she and I were at the same event, a baseball game, without knowing each other. But such was the case for the huge events held in the old Fulton County stadium and in Olympic Stadium. During the olympics, I remember walking down the streets of Atlanta going to the stadia, or going to Centennial Olympic Park, and thinking how beautiful everything looked. The sidewalks were pristine. The roads were clear. For once, there was no construction on roadways in Atlanta. Everything was picture perfect. The same was true of Berry College, where I grew up. Berry hosted the olympic youth camp, so we had young athletes from all over the world staying right there on campus. I played ping pong and pool with Serbian, Kenya, and Thai athletes. In fact, one day I was walking down the sidewalk and, as I passed a young athlete, he held up his hand and said Jambo! It was the one word of Swahili I knew. He was saying hello, so I said Jambo back. Berry looked the best I had ever seen it and probably the best I’ve ever seen it since. Atlanta, Berry, indeed the whole state of Georgia had prepared itself for the advent of the Olympics; we had prepared the way for the athletes, the dignitaries, the visitors from all over the world. Such is the case when we prepare ourselves for any event of significance. This Christmas season, we’ll prepare our homes for the advent of visitors, we’ll prepare ourselves for the advent of Christmas parties as we dress our best, we’ll prepare ourselves for the advent of Christmas Day, ensuring that we’ve purchased gifts for everyone on our list, that the house is ready, the breakfast casserole ready, the gifts wrapped. In many ways, today, the First Sunday of Advent, is at the start of our preparation for the big day. Back in the day of this scripture, the streets were largely unpaved. Reading descriptions of these roads this week often reminded me of the dirt roads in our county. When I first got my convertible, I took it for drives all around the county, both to enjoy the car and wanting to get to know the county better. I have since stopped taking the car out and ride my bike instead. That’s because my little car, with its ride close to the ground and low profile tires, can’t handle the bumps, the potholes, the sudden dips and rises. One day, I figured, I was going to get my car stuck or ruin a wheel. Such is not a complaint; it’s just the nature of dirt roads. And by comparison with the roads of ancient Palestine, the dirt roads of Dodge County are like a newly paved highway. Very often, ancient roads leading from town to town were windy affairs, fraught with potholes and bumps that could ruin your cart. Sometimes, the road simply ended because sand or storm had ruined part of the path, leaving travelers looking for where the road picked back up, hoping they were traveling in the right direction. All too often, the roads in between cities, where there was not much traffic, were frequented by robbers and bandits who would rob and maul passersby. And, in the wilderness, in areas not frequently traveled, visitors encountered strange sights. They would hear the sounds of animals not previously known. Sometimes, they’d catch sight of animals that defied the imagination: gazelles, sand cats, striped hyenas, and oryxes. These are crazy animals, they looked strange, and gave the wilderness a mythic quality. They’d also encounter the endless sands of the desert, the heat of the desert, and would very quickly turn around. For one only went into the wilderness if absolutely necessary. Today, travel through the desert parts of Jordan, Iraq, and Saudi Arabia, what our ancients called the wilderness, is possible because of modern roads but, back then, rarely did anyone venture into the wilderness. It was too wild, too foreign, too scary, too desolate, and too hot. Rather, travelers would go up and around the desert, the wilderness, rather than go through it. Like when we want to avoid Atlanta if we’re going north and take the long way around through Athens or through Anniston, Alabama. To avoid the craziness, travelers went around on a much longer, but safer, cooler, and easier journey. But not for the advent of God’s salvation. John tells us that it will come through the wilderness, across the straight path made by raising up valleys and lowering the mountains. It will come from the place of chaos, the foreign place of heat, it will come through the rough ways made smooth. The advent of the salvation of God will come from the most unlikely of places. The advent of the salvation of God would come through chaos, through mess, through trouble. The salvation of God would come through not the nicely kept streets and well-worn traveled ways, but rather through the hard, difficult, challenging places of chaos and fear. The salvation of God would come through the messes of existence. And to that, John proclaims that the people must prepare! They must get ready. Prepare the way of the Lord is the constant refrain! But this is a far different preparation than we typically make this time of year: they must prepare their messes. Imagine with me that you know you have a house guest coming. If your house is like mine, with two children and a hectic pace of life, there’s usually a mess. Dishes, no matter if they’re done once a day, pile up in and around the sink. There are blankets strewn over couches. Wednesday, I walked into the kitchen and found my path blocked by a gaming chair that had somehow been thrown into the walkway, yards away from its usual location. And Dana’s favorite: my shoes usually end up wherever I kicked them off, and then wherever the kids have pushed them or the dog has taken them. The house usually has some sort of mess to it. 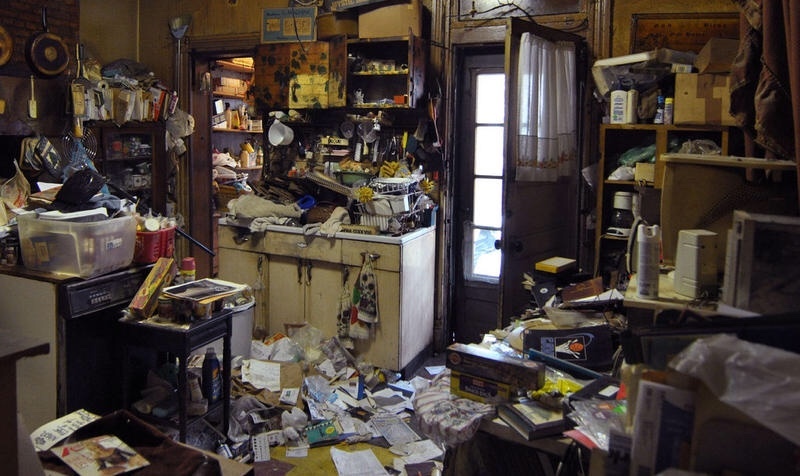 So, imagine with me that, to prepare for the advent of a house guest, you leave the mess out. In fact, you go and find the messiest things that you’ve hidden away: the gross drawers in a bathroom, the unkept closet full of junk, the food long forgotten in the back of the pantry or freezer. You pull all this out and put it on display, adding to the mess. Outside, you make sure to throw leaves everywhere across your yard, hoping that your grass is tall and untidy. The bushes have lots of uneven growth and your trees are in need of water. In the back of the house, you have an old beat up car you keep around. This car goes in front of the house, on display for all to see. Then, finally, you put your dumpster on the side of the road, stacking bags of trash and boxes around it. Leaving the doors to your house open, now, with the trash out, the yard unkept, and messes presented around the house, you’re ready for your house guest. You are prepared. You have prepared the way of the Lord, making straight his paths. This is the kind of preparation John calls for. A straight path through the wild, the desolate, the messy things in our lives. For this is what we do when we respond to the John’s proclamation of a baptism of repentance for the forgiveness of sins. We put our messes out, we present our trash to God, making straight Christ’s healing path through all of our brokenness. The phrase a baptism of repentance might be better put this way: a cleansing of guilt. We are freed from the guilt of sin that comes too easily, and lingers too long, when we realize some sin in our lives. We are freed from regret of past actions. A cleansing of repentance is far different from a call to repentance, which is admission of guilt. Baptism is cleansing, and John offers freedom from the guilt, regret, and angst that too often accompany sin and the memory of sin. For sins are forgiven. Sins meaning anything that has put separation between us and God. Sometimes this is something we do, sometimes this is something done to us, something we can’t let go of. Forgiveness is release: release from the oppression of our sins and the sins of others. We all carry around those burdens, that brokenness, that mess and trash. We have old wounds that seem stubborn in their refusal to heal. We have secret sins we’ve failed to confess to anyone, but they yet eat away at our insides. We have sin, things that we know separate us from the love of God. And to that sin, John tells us that Jesus wants to cleanse it, forgive it. Thus the call: prepare the way of the Lord! Make straight his paths through your burdens, brokenness, mess, and trash. Pull it all out. Place it on the side of the road. And allow Jesus into it. We can do it if we’re brave, bold, willing to be vulnerable with our savior who offers healing this morning. We can do it, or we can be like Tiberius, Pilate, Herod, Annas, and Caiaphas. I’m fascinated by the list at the start of this scripture. There are a few names of rulers of whom we know almost nothing, but in this list of names, these folks are famous, for they are the villains of the story of Jesus’s earthly ministry or, in the case of Tiberius, villain of the early Christian movement. They sought to stand in the way of Christ’s earthly ministry. They heard the call to prepare and, rather than bring out their mess, they hardened their hearts. They would not let Jesus in, they put up the gates. They were like some houses off of rural roads: dark, far off the road, with no lights and a big fence and gate to bar entry. No one should come visit, no one should dare enter, for there will be no visitors, no guests, no advent, so no preparation. They are guarded, seeking to be invisible. That’s the heart of Tiberius, Pilate, Herod, Annas, and Caiaphas. This morning, which describes you: the messy house or the dark house? Are the gates of your heart shut or wide open? I suggest that too often, we all put on a face, thus closing the gates of our heart. We’re perhaps too afraid to admit that we have messes, that we’re not as put together as we appear to be. I confess to you this morning that the last time we had a healing service, I needed some healing in my life. I asked for an anointing that day too because I needed what I preached that morning. I’m just as messy as everyone else. My heart gets hurt like everyone else’s. I sin like everyone else. And so I stand in need of healing. There’s something about this Advent and Christmas season that brings up much of the messes in our lives: old wounds from family, old memories that refuse to fade and still hurt, pains from the past that just won’t quit. Or we simply miss dearly loved ones who have gone on, we long for reunion with family who have moved far away, or maybe it’s just been years since we really enjoyed a Christmas and, as the day approaches, we dread what we might find. There’s something about Christmas that can make our hearts anything but merry and bright. And yet, it doesn’t have to be that way. If we are willing to open our doors, present our messes; if we are willing to prepare our hearts, we will encounter healing, the salvation of our God. Salvation is more than just fire insurance: salvation is God’s grace rescuing us over and over again. So prepare yourself, present yourself for rescue, open the doors to your heart and present your messes. If you desire healing, if you need a cleansing of guilt or forgiveness of your sins, if you are shouldering burdens caused by the sins of others, there is one way and one way only to encounter the healing love of Christ: prepare the way by bringing out the mess. Put the trash of your heart out on display, bring out the hidden messes, and place them before Christ. That’s exactly what you have the opportunity to do here at the rail after you have received of the elements. I and a few others will be there to anoint you with oil and pray for you. You don’t have to tell us anything, just tell Jesus everything. Prepare your hearts now to encounter the living love of Christ. For, indeed, that is the “salvation of our God.” If you need to be saved from yourself, from burdens, or from anything at all, use this time of confession, pardon, and great thanksgiving to prepare yourselves for a powerful encounter with the living Christ. Bring out your mess. Prepare the way of the Lord. Previous Food Boxes | Donate Today! Ted, I NEEDED that message today and I appreciate you always telling me something new, something positive and something I can use!! Thank you!! !